As you explore hiking in the Smoky Mountains, you’ll have a particularly rich experience when you pay attention to the natural community around you. The vast deciduous and coniferous forests of these mountains are an amazing site. Trees, birds, mammals, and wildflowers combine each season to provide spectacular scenery. 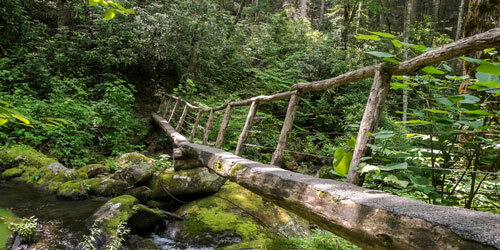 There are 850 miles of hiking trails in the Great Smoky Mountains National Park. 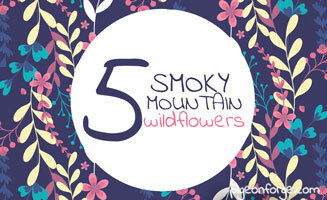 Some of the best times to hike the Great Smoky Mountains are spring and fall. Temperatures are mild and the splendor of abundant spring wildflowers or autumn forests of red and gold prove a thrill for every audience. In winter months, experience the snow-covered mountains; visit in the summer to enjoy cool coves with crisp, fresh air in the depths of the forest. When planning a hike always take these safety precautions: Let someone know where you are going and give them an expected return time so park authorities may be contacted if you do not return as expected. 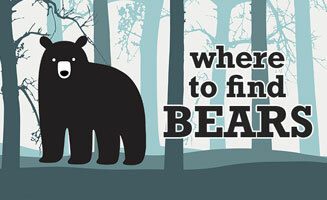 Read trail signs, stay on the trails, and don’t over estimate your hiking ability. Even if only out for a short walk, wear walking shoes or hiking boots, which are designed to give sure footing and ankle support. For day hikes longer than an hour or two, carry along water, a lunch or snacks, and rain gear. It rains frequently in the Smokies! Be prepared! This trail is rated easy and is 5 miles roundtrip with an elevation change of 200 feet. The trailhead is located off of the 11-mile loop in Cades Cove. 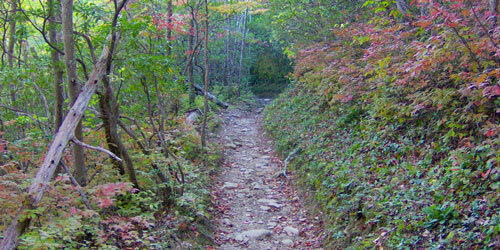 One of the most popular trails in the park, the hike follows Abrams Creek and passes by Abrams Falls. It takes about 3-4 hours to hike to the waterfall and back. The trail to the falls traverses pine-oak forest on the ridges and hemlock and rhododendron forest along the creek. This practically unknown trail leads to Spruce Flats Falls. Only 2 miles roundtrip, the beautiful waterfall and quiet pool at the end are a peaceful getaway from noise and crowds. This hike begins at the Great Smoky Mountains Institute at Tremont, which is located near the Townsend entrance to the park. Drive toward Cades Cove and look for Tremont on the left. After traveling 2.2 miles down Tremont’s road, turn left toward the Great Smoky Mountains Institute at Tremont and bear left to park in the visitor area. Walk up the paved road into the Tremont complex. The trail begins at the simple “Falls” sign about 0.2 miles up this road. Follow the few steps up into the woods and begin your adventure! This trail is 6.6 miles one way, rated moderate. The trailhead can be accessed by taking US-321 east from Gatlinburg or by taking the Foothills Parkway west from I-40. A right turn 1.2 miles south of Cosby takes you into Cosby Cove. About 2 miles after making the turn, you’ll reach the Cosby picnic area with parking for day hiking. If you are backpacking you will need to proceed ahead to the backpacking parking area, just past the registration hut. This trail passes by Hen Wallow Falls and through mature forest; it is the first leg of one of the favorite backpacking loops in the park and home to campsite #34. Elevation gain is 1,300 feet. This is a 1.5 mile roundtrip hike out of the Deep Creek Area. Sliding down 35 feet of sloping rock strata, the water livens and cools the air. Along the route is Tom’s Branch Falls, yet another beautiful falls. This trail is 2.6 miles round trip (to the falls) and is the easiest falls hike on the Tennessee side of the park. The trailhead access is located off of Little River Road at the Fighting Creek Gap parking area, less than 4 miles past Sugarlands Visitor Center. After passing Laurel Falls on this trail, an ascent through virgin forest to the fire tower on Cove Mountain can lengthen this hike. 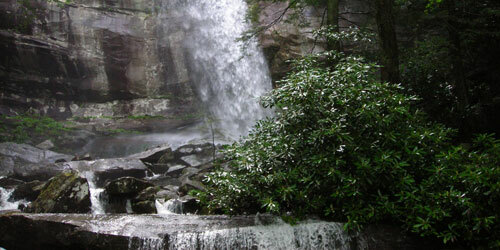 Laurel Falls is a popular destination and designated nature trail. At only 1.3 miles up a paved trail, the 75-foot waterfall is especially interesting because it is a two-step waterfall, with the trail crossing a ledge between the upper and the lower falls. Beyond the falls, the trail is no longer paved and along this stretch you will find more solitude. This trail is 6.4 miles one way and is rated easy with an elevation gain of only 500 feet. The trailhead is located off of Jake’s Creek Road inside Elkmont. This relatively easy trail joins the Elkmont area with trails leading to The Sinks on Little River Road and Tremont. Meigs Mountain was named for Return Jonathan Meigs, who surveyed the line between white and Indian lands through the Smokies and who was named U.S. agent to the Cherokees in 1801. This trail will take you by a clearing that was the homesite of Lem Ownby, the last life-time lease holder in the park. “Uncle Lem”, as he was called, lived in a log cabin on the trail until his death at age 100 in 1989. At 6,593 feet, Mount LeConte is The third highest peak in The Great Smoky Mountains National Park, behind only Clingmans Dome and Mount Guyot. It is however, from top to bottom, the tallest mountain in the Eastern United States, rising 5,301 feet. It also has four subpeaks. 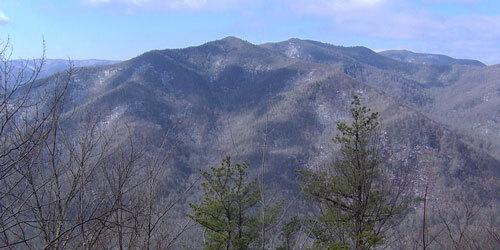 West Point, High Top, Cliff Tops, and Myrtle Point, all of which rise above 6,000 feet. You will find Rainbow Falls on this hike. This trail is 5.2 miles round trip and rated moderate. The trailhead begins 2.4 miles up Cherokee Orchard Road. This is accessible from Historic Nature Trail/Airport Road (light #8) in Gatlinburg. Rainbow falls is at 4,000 feet in elevation and if your timing is right, mist from Roaring Fork Creek’s spill over the 80 foot ledge creates a rainbow in the early afternoon. The falls hike is very popular by itself, but for the more adventurous, passing the beautiful falls and continuing on to the summit of Mt. LeConte is also a possibility. This trail is 12.8 miles round trip, but in winter months, the length climbs to 17.4 due to Roaring Fork Motor Nature Trail’s winter closure. Take Historic Nature Trail/Airport Road (light #8) in Gatlinburg and continue straight into the park via Cherokee Orchard Road. Once on Roaring Fork Motor Nature Trail, look for Rainbow Falls signs as a signal you are approaching the trailhead. Located on the right side of the road shortly after passing the parking area for Rainbow Falls is a small sign marking the beginning of this beautiful trail. Trillium Gap Trail is the only horse trail to the summit of Mt. LeConte and is the trail used to transport supplies to LeConte Lodge. You may get to see llamas on the trail because lodge managers use these sure footed animals, instead of horses, to carry their supplies. LeConte Lodge is open from mid March to mid November. For more information or to make reservations at LeConte Lodge, call 865-429-5704. Only 1.2 miles up the Trillium Gap Trail is the only waterfall in the park that visitors can walk behind. A trip to Grotto Falls makes a wonderful family hike and the falls, along with multitudes of wildflowers visible in the spring, provide wonderful photo opportunities! If distant views of mountain ridges are what you seek, Andrews Bald Trail leads to the highest bald in the park (5,860 feet in elevation), which is perfect for stretching out in the grass to enjoy, not only views of Fontana Lake and azaleas in the spring, but also panoramic views of the park’s amazing fall coloration in autumn months. Remember not to plan this hike for winter months unless you want to add another 7 miles each way! This trail is 5.1 miles one way and is rated difficult, with an elevation gain of 3,000 feet. The trailhead is located at the far end of the Cades Cove picnic area. The combination of Anthony Creek and Bote Mountain Trails takes you to Spence Field where, by walking to the left on the AT, you’ll discover panoramic views. This trail winds through a mixed forest of hemlock, hardwood, and rhododendron with Anthony Creek on the right. A horse camp and campsite #9 are found along the way. The Bote Mountain Trail is an old road that passes along the ridge of Bote Mountain. When the road from Cades Cove to Spence Field was built in the 1850s, Cherokee workers were asked which ridge the road should follow. The workers pointed to the mountain and said “Bote”; i.e., “I vote for that one”, except there is no “V” sound in the Cherokee language. This trail is 12.6 miles round trip and is a strenuous climb. Take Historic Nature Trail/ Airport Road (light #8) in Gatlinburg. This road soon becomes Cherokee Orchard Road and you’ll cross the boundary to the park at 0.9 of a mile. Head to the right from the Rainbow Falls parking area into the woods and come to the intersection of trails. Turn right to get to the Bullhead Trail. This trail ascends through a canopy of young hemlock. You’ll find outstanding views as you continue your ascent. Watch for a boulder on the left after 3.0 miles that you can stand on to see over the heath into the valley below. On a clear day, one can see English Mountain to the northeast and Sugarland Mountain to the southeast. Elevation gain for this trail is 4,000 feet. This 8 mile roundtrip hike is rated moderate. Following the Appalachian Trail, this hike travels to rock crags along the state-line ridge, the main crest of the Smoky Mountains. By taking the AT trailhead in the corner of the Newfound Gap parking area, this segment will lead you to a rock outcropping, Charlie’s Bunion, which provides wonderful views of the Tennessee side of the mountains. Located about 7 miles past the Sugarlands Visitor Center on Newfound Gap Road, this 4 mile round trip hike is a very popular attraction in the Smokies. In 2 miles, hikers climb 1,650 feet! Two rock spires, 4,755 feet in elevation, await those who manage the strenuous path to the top. Please note that this trail is slippery in the spring due to its rocky nature and the creek that crosses it. Wear proper shoes and also remember to keep children close by. A spectacular 360-degree view awaits those who complete this climb! At 6,643 feet, Clingman's Dome is Great Smoky Mountains National Park’s highest point. It is the highest point in Tennessee. Clingmans Dome is a popular Park destination. 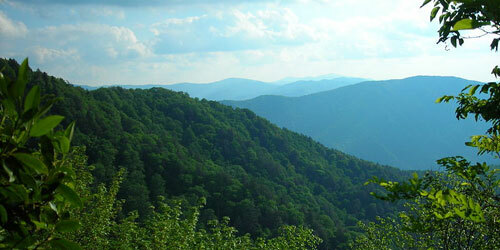 Located along the state-line ridge, it is half in North Carolina and half in Tennessee. 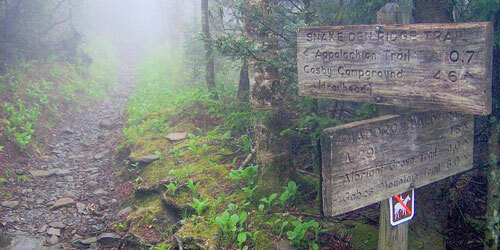 The peak is accessible after driving Clingmans Dome Road from Newfound Gap, and then walking a steep half-mile trail. A paved trail leads to a 54-foot observation tower. The Appalachian Trail crosses Clingmans Dome, marking the highest point along its 2,144 mile journey. Vistas from Clingmans Dome are spectacular. On clear, pollution-free days, views expand over 100 miles and into seven states. However, air pollution limits average viewing distances to 22 miles. Despite this handicap, breathtaking scenes delight those ascending the tower. It is a great place for sunrises and sunsets. Cloudy days, precipitation, and cold temperatures reveal the hostile environment atop Clingmans Dome. Proper preparation is essential for a good visit. Weather conditions atop Clingmans Dome change quickly. Snow can fall from anytime between September and May. Get a current weather forecast before heading to the tower. Although Clingmans Dome is open year-round, the road leading to it is closed from December 1 through April 1, and whenever weather conditions require. People can hike and cross-country ski on the road during the winter. This trail is 4.1 miles one way and is rated moderate with an elevation gain of 2,250 feet. The trailhead is located off of Jake’s Creek Road in Elkmont. The Jake’s Creek Trail climbs to Jake’s Gap where you can take the Blanket Mountain Trail to the summit of Blanket Mountain. There is also an observation tower that is open to the public. To get to the tower you must take the 1/2 mile hike. The visibility from the observation tower can be up to 40 miles on clear days. On hazy days the visibility is much less, but the view is still one of the best around. The railing on the tower is low, so if you bring children, be sure to keep an eye on them. There is also a natural observation on the opposite side of the Look Rock parking lot, although it still harbors beautiful views, it does not offer the 360 degree panoramic view like the tower. This trail is 5.4 miles one way and is rated moderate with an elevation gain of 2,600 feet. The trailhead is located at the Cosby access in the campground just before the B100 campsite. This trail provides a shorter route to the Mt. Cammerer fire tower and forms a loop hike with the Appalachian Trail and the Lower Mt. Cammerer Trail. The trail’s ascent follows Cosby Creek, with a ravine separating the trail from the creek on your right. The trail curves left at 0.9 of a mile and continues to ascend through large hemlocks and poplars. Watch for a large poplar that leans over but then bends and stretches straight up in search of light above the canopy. This trail is 7.4 miles one way and is rated difficult with and elevation gain of 2,600 feet. trailhead is located at the Cosby access in the campground near campsite B100. There is limited parking and the campground is closed in the winter, so you may need to park at the backpacker’s parking area near the registration hut. This trail is part of a long backpack loop that takes you by the Mount Cammerer fire tower. The trail ascends through hardwoods and rhododendron to a rock-hop crossing of a creek at 0.9 of a mile that flows down to Toms Creek, which is audible on the left. The trail then descends to cross this main creek on a footbridge at 1.0 mile. At 2.3 miles along the AT, you’ll reach a gap where the Mt. Cammerer Trail leads right 0.6 of a mile out to the Mt. Cammerer fire tower, perched atop a rock outcropping known locally as “White Rocks”. From here you can enjoy one of the best views in the park. This trail is 7 miles one way and is rated difficult. The trailhead is located off of US-321 between Cosby and Gatlinburg, 15 miles east of Gatlinburg, turn right onto Baxter Road (Past Yogi Bear Jellystone Park Camp Resort) and make a right onto Laurel Springs Road. Look for a gravel road blocked by a gate. This is the trailhead. This trail ascends to a heath bald with several picturesque views and along the way takes you by the Albright Grove Nature Trail (1.3 miles in) that contains one of the park’s best stands of virgin forest. Look for a yellow poplar or tulip tree, the “largest known specimen in the park”, that is 135 feet tall and over 25 feet in circumference. Maddron Bald Trail is home to campsite #29. Elevation gain is 3,500 feet. This trail is 12.3 miles one way and is rated moderate with an elevation gain of 3,500 feet. The trailhead is located off Little River Road at the Laurel Falls parking area. This trail connects Little River Road with the crest of the Smokies, passing a good view of Mt. LeConte. The trail first climbs through a pine-hemlock woods and then turns right into a hardwood forest. You’ll climb steeply and cross the upper reaches of a ravine and a small stream. After 9 miles you’ll find an arrow carved in a tree on the left. This is the junction of a 0.4 of a mile un-maintained manway that drops down to connect with the Chimney Tops Trail. The Appalachain Trail, which streches over 2,000 miles, from Maine to Georgia, was first proposed by Benton MacKaye as an effort to connect various parks nationally. The 2,175 mile trail crosses six national parks, including the Smokies, and it is said that to walk the length of the Trail would take over five million foot steps, a feat that over 10,000 people claim to have over the past 83 years. The part of the trail that stretches over the Smoky Mountains is 293 miles and it is suggested to go in Late May through October as the winter months will have much snowfall and Spring time brings lots of rain. Where the Trail runs through the Smokies is known as the Roan Highlands which is home to wide open views of grassy balds, such as Hump Mountain and plentiful Rhododendron gardens. These balds are also spots which can harbor serious and dangerous weather and lightning is quite common in the summer months. This trail is 11.8 miles roundtrip and is rated moderate. trailhead is accessed 1 mile up the Porters Creek Trail. At the top of the road, turn around to find the beginning of the Brushy Mountain Trail. 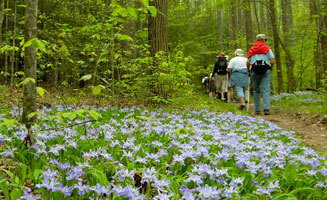 This trail has frequent patches of wildflowers in the spring and several stream crossings. At 0.4 of a mile you’ll see an old home site on the right that is marked by a collapsed chimney and washtub. Elevation gain for this trail is 2,500 feet. Take note that several trails will cross this path; make sure to determine your direction using trail signs! This 0.8 of a mile loop, located inside the Chimney’s Picnic Area, provides easy access to a stand of old-growth forest, as well as wonderful wildflower viewing opportunities in the spring. Take a quick hike and then head to a picnic table for a relaxing meal. Simply drive up Newfound Gap Road/US-441 to the Chimney’s Picnic Area and then look for parking on the right almost immediately upon entering this area. The trailhead is above the parking lot. This trail is 4.9 miles one way and is rated moderate with an elevation gain of 2,700 feet. The trailhead is located at the end of Forge Creek Road. This trail is one of the most popular routes to get to Gregory Bald, which, in the spring is a patchwork quilt of blooming azalea. The Gregory Ridge Trail begins by leading around the base of a ridge through lush rhododendron and mountain laurel, both adding to the spring and summer floral display for which this trail is famous. Also, at 0.3 of a mile you will see where Bower Creek spills down to join Forge Creek. This trail is a 5.1 mile, one way loop, rated easy, with an elevation gain of 1,000 feet. 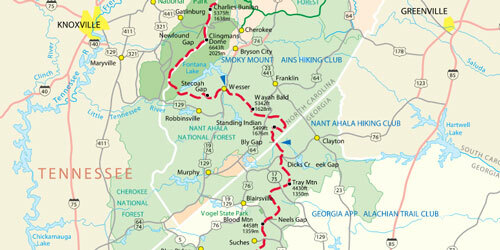 The trailhead is located in Elkmont at the road fork, 2.3 miles from the Little River Road turnoff. Parking at the turnaround or along the side of the road is an option. This relatively easy walk on an old roadbed that keeps company with the Little River most of the way is a nice day hike for families and is pretty year round. The road you follow into Elkmont is the old route of the Little River Railroad, part of the Little River Lumber Company, a major logging enterprise during the time when the forest was cut for lumber. Along the road you will pass the site of the Wonderland Hotel on the left. Built by the Wonderland Park Company, the hotel opened in 1912 to serve people riding the logging train into the mountains. Along your hike occasional benches invite you to stop and enjoy the sunshine on the violets, spring beauty, hepatica, and anemones in spring. This trail is 3.7 miles one way and is rated easy. Head east from Gatlinburg on US-321, turn south at 5.9 miles into Greenbrier. The road follows along the west side of the Little Pigeon River and becomes gravel in one mile. Continuing straight, you’ll pass a picnic area on the left and then reach the end of the road and the beginning of Porters Creek Trail. This is an outstanding trail for wildflowers! In March and April you’ll find bloodroot, trillium, May apple, trout lily, chickweed, phlox, spring beauty, and toothwort. Elevation for this trail is 1,550 feet. This trail is 8 miles roundtrip and rated moderate. trailhead access for Ramsay Cascade is found by turning left at 3.2 miles along the Greenbrier Road. This road follows along the Middle Prong of the Little Pigeon River for 1.5 miles until it is blocked; this is the trailhead for Ramsay Cascades. The trail begins at the end of the parking lot area and soon crosses the Middle Prong of the Little Pigeon River on a wooden bridge. You’ll gradually ascend through large boulders and a forest of hemlock and mixed hardwood along an old roadbed with a stream on the right. Elevation gain for this trail is 2,200 feet. This trail is 5 miles one way and is rated moderate with an elevation gain of 2400 feet. 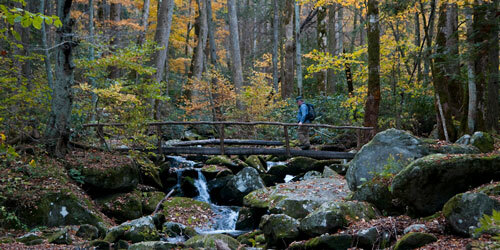 The trailhead is located at the back of the Cades Cove Picnic Area or 1.5 miles down the Anthony Creek Trail. This short trail serves to connect the Anthony Creek Trail with the Appalachian Trail to form a backpacking loop while passing Russell Field. This trail is 5.3 miles one way and is rated moderate. The trailhead is located in Cosby Campground, in the southeast corner, at campsite B55. Walk up the gravel road and the trail joins a horse trail from the left that is a connector trail with the Low Gap Trail. Along this road you’ll walk through second-growth deciduous forest, and in the fall, the woods are draped in brilliant reds and yellows. The trail climbs up the ridge of Snake Den Mountain through a series of switchbacks. At 2.4 miles, an overlook provides a view of Cosby Cove. Continuing straight ahead, the Snake Den Ridge Trail passes spruce and fir as it reaches the crest of the mountain range at 5.3 miles and joins the Appalachian Trail at Inadu Knob. The Sugarland Valley Nature Trail was built in 1993 to provide a paved, flat trail into the woodlands of the Smokies. This 3,000 foot loop allows visitors requiring handicap access a chance to see historical remains and a beautiful river while experiencing nature all around them. Stop by the Sugarlands Visitor Center to pick up special media which can guide visitors along the trail. The trailhead is located 1/4 mile up Newfound Gap/US-441 from the Sugarlands Visitor Center. This trail is 7.6 miles one way and rated moderate. trailhead access for this trail is just before the turn to Ramsay Cascades, beginning on the right side of the road. 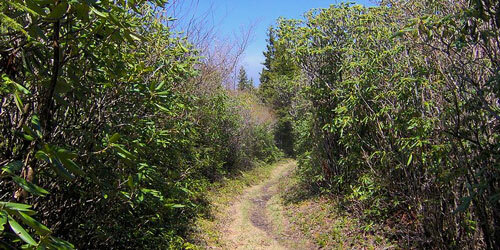 The trail takes you through a mix of rhododendron, laurel, hemlock, and hardwood forest. You will also see several old home sites and rock walls along the way. Elevation gain for this trail is 1,000 feet. This trail is 15.9 miles one way and rated moderate. trailhead access is located past the trailhead for the Grapeyard Ridge Trail on the right. Turn left on the road to Ramsay Cascades. One tenth of a mile after crossing the second bridge, you’ll find parking and the Old Settlers trailhead on the left. The hike may be long, but it is a fairly moderate lowland path that has good displays of wildflowers in spring and frequent remains of old settlements. Elevation gain for this trail is 1,200 feet and it is home to campsite #33.